The New Year is filled with goals and resolutions aimed at improving oneself. When thinking about ways to improve their lifestyle, most people think about things related to their day-to-day life. A really popular resolution for 2018 is practicing self-care regularly which includes your hair, makeup and overall beauty routine. The stylists at Salon Sora are happy to help you break some habits! Did you know that making some small changes to your beauty routine can get you moving successfully towards your self care goals? While your making your “New Year, new me” list, make sure to add breaking these top 5 bad beauty habits to your list. After a long day at work or a fun night out with friends, sometimes the thought of having to wash your makeup off can seem impossible. We get it. We’ve all been there, but let’s make a pack to not do this again. After all, all of that long wear foundation isn’t clenching onto your face for no reason. It’s sitting tight in your pores, along with oil, dirt and bacteria. It’s a lethal combination of gunk that’s ready to cause some trouble, also known as a break out pimple just waiting to make its debut. Just think, this beauty nightmare can be avoided by taking a few minutes to cleanse your skin before hitting the sack. Pro Tip from our Make Up Stylists in Boca Raton: Use a makeup removing wipe or micellar water as the first step in your cleansing routine. This will help to break down the makeup on your face. Following up with a cleanser will ensure that your face is squeaky clean, leaving Mr. Pimple with nowhere to live. No one likes to clean their makeup brushes, but it’s a job that needs to be done at least once a week, especially if you are using your brushes daily. Makeup brushes get full of a combination of product and the bacteria that they have picked up from your face. Keeping your brushes clean not only prevents breakouts, but also helps to preserve the life of your brushes. Even if you’re growing out your tresses for 2018, regular haircuts are still in order. Although it may seem counterintuitive, it actually helps your hair grow healthier. Without trims, split ends will continue to split further and will not only make your hair look unhealthy, but can also compromise the strands. 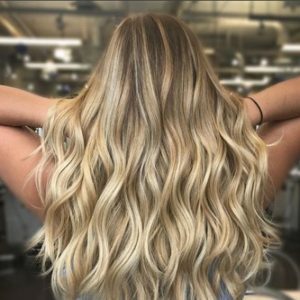 Talk to your Salon Sora stylist in Boca Raton, FL about how often you should be coming in to have your ends trimmed to make sure you stay on an individualized plan for your hair goals. We love dry shampoo, we really do, but it doesn’t replace the need for washing your hair regularly. A good old scrubbing with the right shampoo and conditioner will remove dirt, buildup, and promote scalp health. And as you may know, the scalp is the foundation of healthy hair. So how often should you really be washing your hair? That depends. On average two or three times a week is recommended, but that can vary based on the texture of your hair and the amount of oil that your scalp produces. Next time you’re in the chair at Salon Sora in Boca Raton, ask your stylist what he/she recommends for you. When your manicure is past its prime, it’s time to remove the polish once and for all. There is no negative effect in leaving it on, other than aesthetic. However, if you’re one of those people that likes to pick at your polish, then there can be some trouble. Doing this can actually remove the top layer of your nail making it weaker and subjecting your nail to breakage. Avoid all that drama by removing the nail polish with nail polish remover, or better yet, stop in and treat yourself to new manicure. What bad beauty habit are you ditching this year?